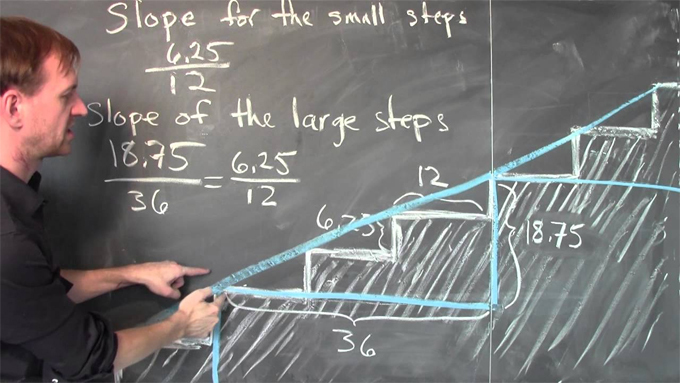 This construction video is created by Jim Fowler, PhD, The Ohio State University, and it provides the detailed process for measuring the slope of a staircase. Here the staircase contains small steps and large steps. For small step height is taken as 6.25 inches and width is taken as 12 inches. For large step height is taken as 18.75 inches and width is 36 inches. So, slope for the small steps = 6.25/12 and slope for the large steps = 18.75/36. These two slope are equivalent as we can reduce its fraction by dividing numerator with 3 and denominator with 3. The slope can be applied for ascertaining steepest flight of stairs.